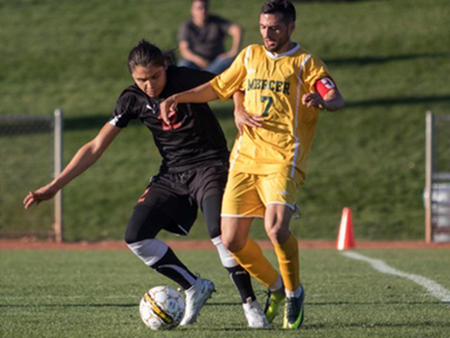 Eiichi Yamaguchi scored four goals in the team's 8-2 win over Waubonsee at nationals. His season total was 29, the third highest in the country. Co-captain Emiliano Fama was solid in the backfield. He is pictured in the Vikings' final game, when they fell to Yavapai. Co-captain Adir Versano was a true team leader. He is pictured in the Vikings' win over Waubonsee. The Vikings claimed the Northeast District title on Nov. 5 after victories over Massasoit and Monroe (Bronx). 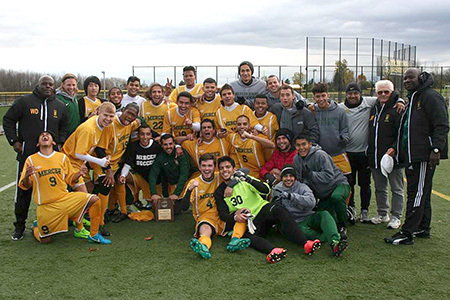 The road to nationals began with the Vikings's 3-1 win over Essex in the Region 19 champship. 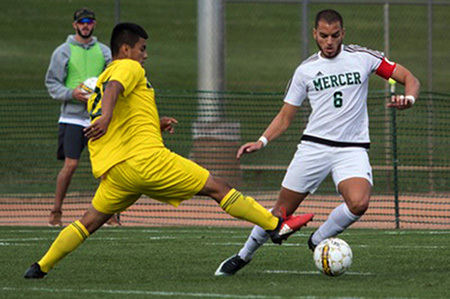 West Windsor, N.J. – The Mercer County Community College (MCCC) men’s soccer team ended its season accomplishing just about every one of its goal – including the scoring of many goals! 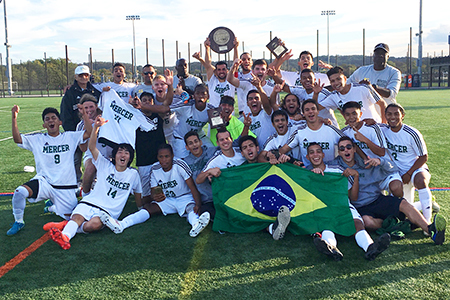 The team made a return trip to the National Junior College Athletic Association (NJCAA) Division I National Championship for the first time since 2008 and ended the season eighth in the country with a record of 20-4-1. 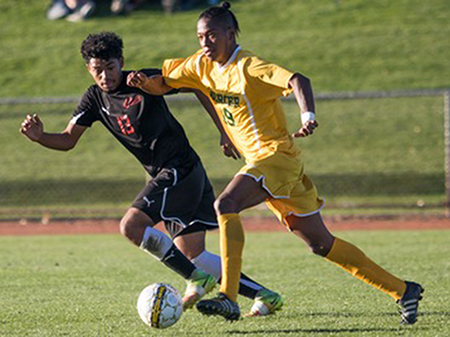 The 12-team tournament was hosted by Yavapai College in Prescott, AZ., Nov. 13-18. As in any typical year, a few players’ injuries made an impact in several games. The team suffered three losses in September, two of them in overtime and the third by one goal. But from that point on, the Vikings went on a 12-game winning streak that took them all the way to their final game at nationals on Nov. 15. The Vikings came prepared for battle throughout the season, but they really showed their mettle when it counted most, with a 4-2 win over Harcum College in the Region 19 semifinal Oct. 21, and a 3-1 win over Essex County College in the Region 19 final on Oct. 28. The Vikings looked just as strong in the four-team Northeast District Tournament, played at Monroe College (Rochester, NY) Nov. 4-5. First they faced Massasoit, winning 2-0, and then defeated Monroe (Bronx) 1-0 in the final to capture the Northeast District title. Freshman Oshana Boothe scored the lone goal of the final with just 11 minutes remaining in the second half. One freshman who was clearly ready for action from the opening kickoff on Aug. 26 was forward Eiichi Yamaguchi, who scored two goals in a 3-1 win over Genesee. He went on to score a season total of 29 goals, including four goals and two assists against Waubonsee at the National Tournament. His goal total was the third highest in the country and he was ranked sixth nationally in points (which includes assists). He was named the Garden State Athletic Association’s (GSAC's) Player of the Week twice during the season and was a First Team All-GSAC and All-Region 19 selection. The team captains, midfielder Adir Versano, defender Emiliano Fama, and defender Dwight Donis, led by example. Dalce said all three set a tone that helped every player deliver to his utmost potential. “Adir was a true leader. He understood the Mercer soccer tradition. He was a good player and a good human being,” Dalce said. "Emiliano had two great seasons with us [in 2015 and 2017]. He got better both academically and athletically. He was very respectful and a very good captain. He didn’t know a lot of English when he got here and he improved a lot. Dwight was a workaholic who would always do more than asked. He grew faster and more skilled over time." Numerous other players contributed significantly to the Vikings’ deep roster. Midfielders Joao Cadima, Kotaro Okada and Jonas Castelhano Da Silva were highly effective, as was Jaime Chavez, who could play anywhere on the field. Goalkeeper Francesco Zanin was strong in the net, but got injured towards the end of the season. Backup goalie Erick Guimaraes-Cavalcante took over the tough job for the remainder of the year. According to Dalce, these student athletes were also committed to academics. “We always stress that classes come first. And that relates to what happens on the field. Players must find balance. When they do, they have success in the classroom and on the field. “I tell them there are two things you can’t get back: time and money. So their experience at Mercer is not just about the soccer program. You are here. You should do your best in everything,” Dalce emphasized to his team. The Vikings' prospects for another successful season in 2018 are strong. “We expect a lot of the freshmen to be back and we are already connecting with some strong recruits,” Dalce said. Dalce was assisted this season by Haris Abawi, Milton Suah and John Pietrowski.